Radio Section was part of the Engineer-in-Chief’s office of the New Zealand Post Office and should not be confused with the much later-formed Radio Division which was part of the Director-General’s Office. The 1920s had seen tremendous expansion of radio for telegraphy, made possible by advances in shortwave radio. Demand for radio-based services was increasing rapidly but people with the required skills and knowledge were few and far between. When other Government departments needed to install radio or other electronic equipment, such as PA systems, lacking in most cases their own technical resources, the P&T was their “go to” organisation. A few people knowledgable about radio and electronics could be found in the P&T Department. There was also a small number in broadcasting groups, a few teaching in universities and a few amateur radio operators. To make the best use of skilled staff already in the P&T Department it was decided to bring them together in a Radio Section. In very early days (prior to 1935) some limited work was carried out in what became known as the “Lab” located in the Hope Gibbon Building (Inglewood Place; 7 Dixon Street). Although part of Head Office, Radio Section was unusual is that it also carried out a number of functions of District Offices. Some have suggested that it functioned as a District Office on a national scale. This arrangement sometimes raised issues with established District Office staff who at times resented outsiders operating in their patch. When first established, Radio Section was part of the Radio and Transmission Section of the Chief Engineer’s Office of the Post and Telegraph Department, which was in 1958 renamed the NZ Post Office. By 1937, probably earlier, Radio Engineer Mr EHR Green was in charge of the section. See 1937 staff list. In 1935, Radio Section is believed to have been located in the single-story building (1) near the centre of this photo, adjacent to the Telephone Exchange (2) and Parcels Branch (3). In 1935 the section was housed in a wooden building on the corner of Stout and Whitmore Streets. This building was adjacent to the Parcels Branch building on the corner of Whitmore and Featherston Streets. These locations are now covered by the “new” Stout Street Exchange building. 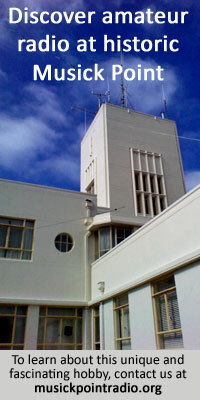 By September 1939, when the section moved to the Wellington East Post Office (WEPO) near Courtenay Place, the section had separated from Transmission Section and was now exclusively the Radio Section. With the move to WEPO, working conditions improved considerably and work grew rapidly. Involved in the establishment of HF Maritime and long distance telecommunications radio systems, Radio Section had made a name for itself internationally and at home, but this was nothing compared with what was yet to come. An example of the work being undertaken for other departments was the design and construction of aeradio stations on behalf of the Controller of Civil Aviation. Initially, equipment installed consisted of MF transmitting and receiving equipment for communications with aircraft and other aeradio stations. This was soon followed by HF equipment for point-to-point working between stations. At each station, the transmitting and receiving equipment were well-separated to reduce interference. New stand-alone buildings of standard design were constructed to house all the receiving facilities. Direction-finding equipment was also installed. Stations were constructed at Waipapakauri, Mangere, Musick Point, Tauranga, Napier, Gisborne, Palmerston North, New Plymouth, Lyall Bay (DF only), Blenheim, Greymouth, Westport, Hokitika, Harewood, Jackson’s Bay (limited service only), and Taieri. All these stations were designed, installed and staffed by Radio Section. Construction and earthworks were undertaken by the Ministry of Works (MOW). Mr EHR Green CBE, JP, MSc, FIEE, MNZIE, who later became the Engineer-in-Chief of the NZPO. Mr TE Clarkson MBE, BSc, MIEE, MNZIE, who later became the Deputy Engineer-in-Chief of the NZPO. Both of these Professional Engineers contributed extensively to early radiocommunication history in New Zealand.